Alright, so it’s all a bit dramatic, but likening Gatebil to a battle is no exaggeration (just look at Paddy’s post). And with battles you need warriors. Which serves as the perfect introduction to Kai Bakken’s fire-breathing, no-prisoners-taken Audi. 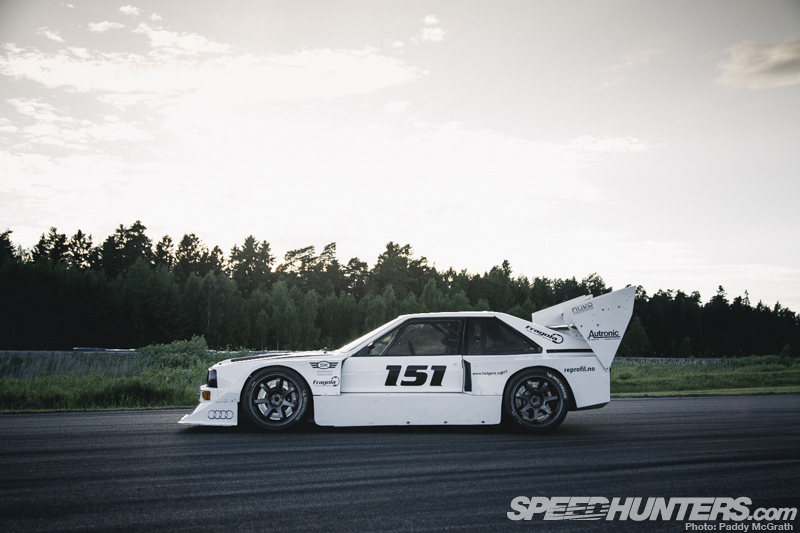 If you’ve seen any coverage of Gatebil at all, you will no doubt have seen the car before. Let’s face it, it’s not as if you could miss it. This car is the antithesis to the trailer queen. It’s a raw and ready racer, brutal and in-your-face; a serious weapon of mass destruction designed and built from the ground up to do just one thing – wage war on the track. 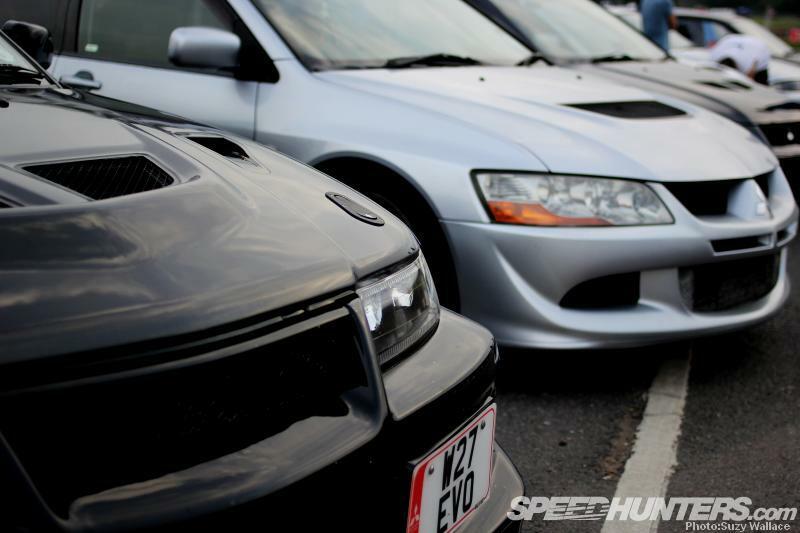 My first up-close-and-personal introduction to the car was during the Swedish leg of Gatebil at Mantorp Park. Arriving on the Thursday evening, Paddy and myself went for a wander round the paddock to see what crazy machinery had already turned up. 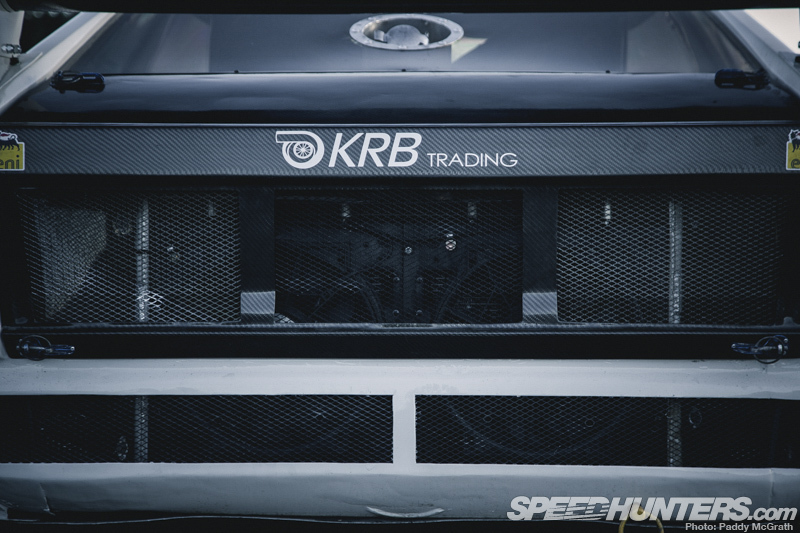 After a photoshoot with the Black Smoke Racing W203 Wagon, we rounded the corner and saw the KRB trailer. Paddy wandered over and said hello to the KRB guys, but I remained rooted to the spot. Looming before me was the inimitable shape of one of the most bonkers builds I think I’ve ever seen in the flesh. I’d seen pictures of the car before but in person, my brain went into overload; my eyes flicked between the animal-scooping front end, the insanely wide box arches and that rear wing, not knowing which one to try and take in first. I was transfixed. 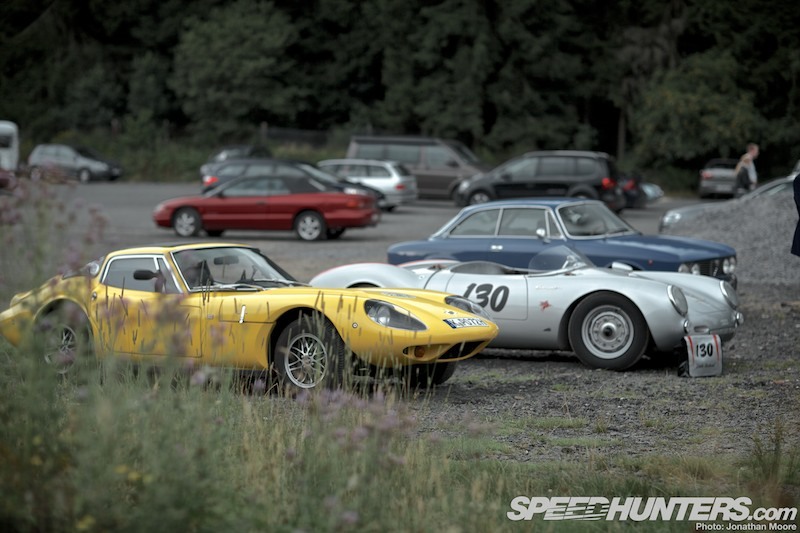 It’s hard to believe that this car started off life as a lowly FWD Audi Coupé Type 85. But even mighty warriors have to start off as children. 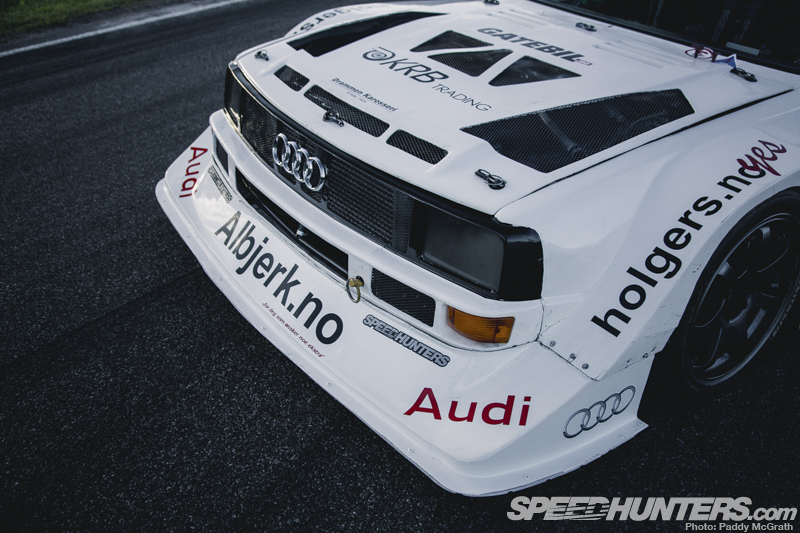 Since Kai started KRB Tuning back in 1994, he’s earned a reputation as one of the best Audi tuners in Norway. 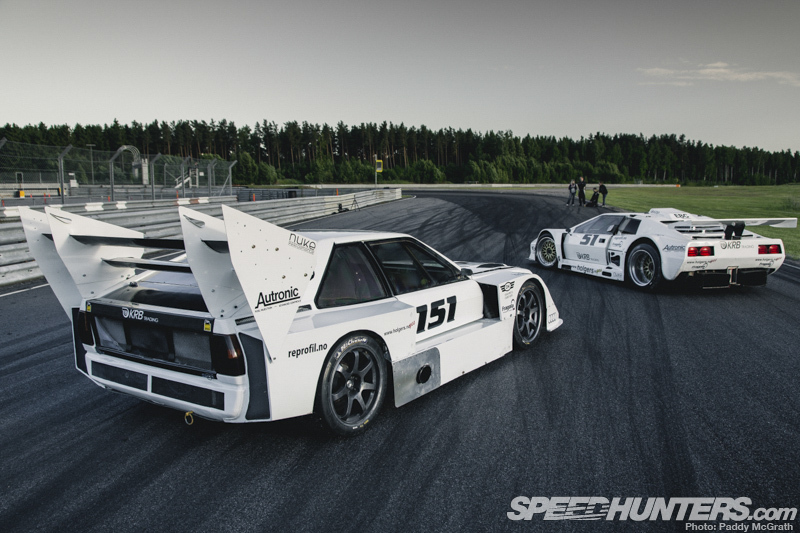 With his background in racing and after building a race-spec Ur-quattro, he was faced with piecing together his ultimate build based on the experience he’d garnered. The aim was simple: a full-on race build with all emphasis on going quick. And so, like a sacrificial animal, the Coupé was butchered and pulled apart before being rebuilt again from the ground up with a full tube chassis. As well as lightening the car, Kai was out to improve upon the Audi’s customary nose-heavy weight distribution. In doing so, the engine was moved a massive 80cm rearwards of its original position. That’s more than half of my height! The entire engine now sits behind the front wheels, and the work done on the Audi means that it’s ticked Kai’s box, with the car now sporting a perfect 50/50 weight distribution. 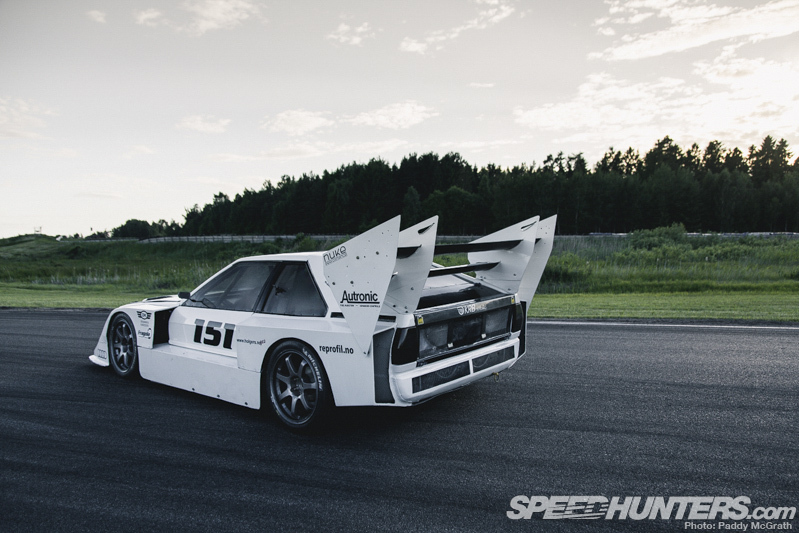 With the aim being to build a circuit racer with a touch of Pikes Peak influence, the bodywork originally came a fibreglass S1 Pikes Peak replica bodykit, but Kai wasn’t content with it as is. The bodywork you see now has all been moved around and adjusted and besides the roof and spoiler side plates, is all fashioned from carbon fibre. The end result is akin to a thrash metal singer going up to a small child and screaming their lyrics into their face. It’s pure intimidation. Of course, there’s that wing too. It originally had six wings (yes, six!) but has since been reduced to two, down one from last season (as in the picture above). Why you’re wondering? Well it might be something to do with the time that Kai was racing at Mantorp Park. After being full throttle all down the back straight, he went to brake for the corner and found that he barely had any brakes. But it wasn’t brake failure. No, he just had so much downforce on the rear of the car that the front wheels were lifting off the ground. At 160mph+. That’s definitely new underwear time. You can see just how far back the engine sits here – completely behind the front wheels. Of course, with a car that looks this aggressive, you need some serious power to back up that appearance. It’s safe to say nothing’s been left untouched in the five-cylinder, 20V, turbocharged 2.5-litre lump. Forged internals come courtesy of CP pistons and KRB rods, and are mated to a race-prepped cylinder head with custom cams and valvetrain, and KRB’s own intake and exhaust manifolds, as well as a host of supporting mods. Of course, there’s no missing the Comp CT43-7279 turbo. It’s an interesting choice too – the ceramic ball bearing turbo is oil-less, using a high temperature grease instead for lubrication. This set-up allows for faster spool-up due to less friction, removes any issues with cold start-ups or hot shut-downs and also gives the added advantage of being able to be mounted anywhere and in any direction. Trick! 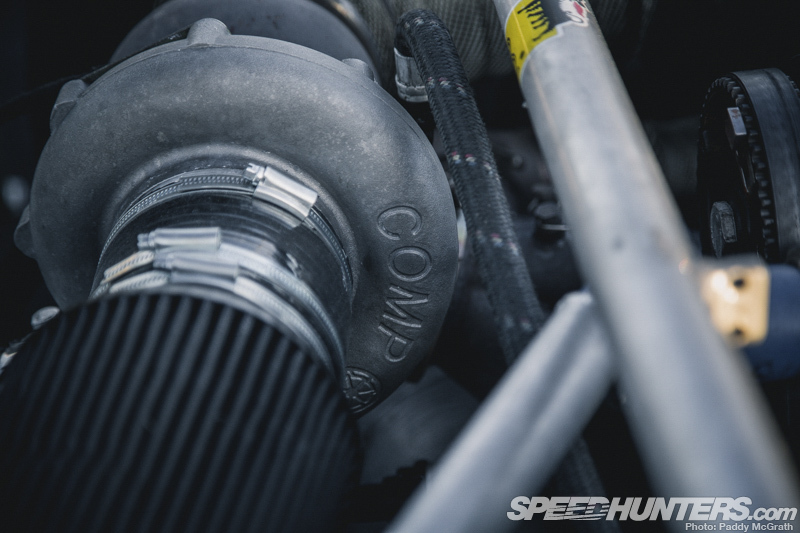 With everything being controlled by an Autronic SM4 ECU, and the engine safely cared for by a KRB/Petersen dry sump system, the end result is a mind-blowing 1061whp, with a staggering 1004Nm of torque. Given that this is a car running AWD, which means big losses through the transmission too, that figure is almost difficult to comprehend. On track, Kai runs between 700-850whp to keep things manageable. 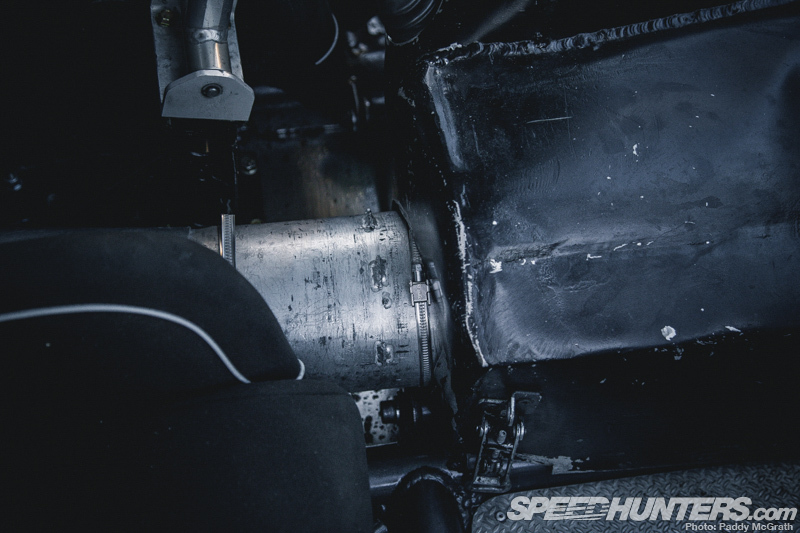 … while the exhaust gases are dumped straight out of the side-mounted exhaust. Inside the car it’s all business. 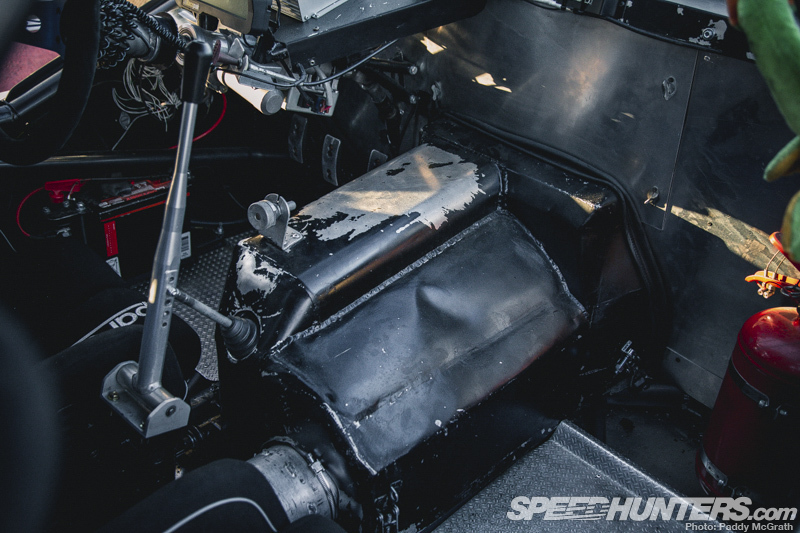 There’s no frills or luxuries here, just the bare basics of what’s needed to get the most out of the car. That stuffed bird mascot you see in the background? Definitely essential equipment. 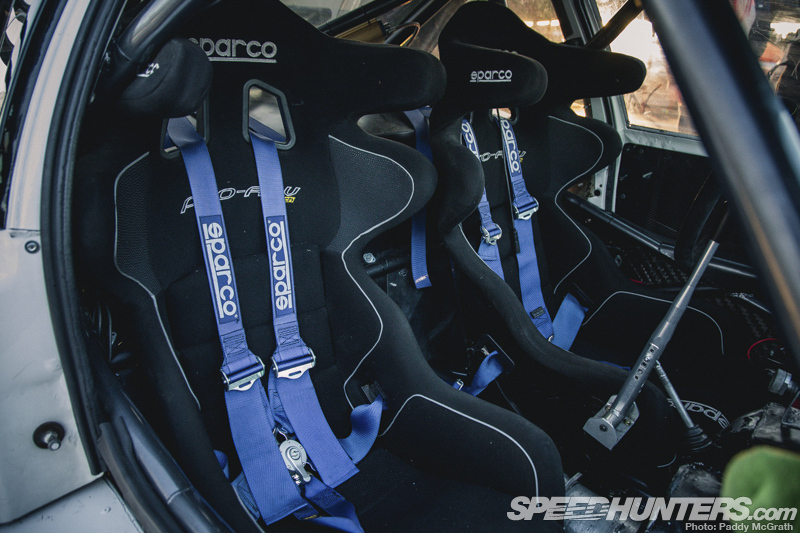 Sparco seats and harnesses keep both Kai and a passenger firmly planted as they ride into the fray. Doing the job of transmitting all that power to all four wheels is a custom Sellholm MPG sequential gearbox with an integrated centre diff. Both front and rear diffs are also uprated Sellholm units, as are the driveshafts. It’s all needed to take that power and actually put it down on the ground. If, like me, you’re wondering what the other tunnel is, it’s actually to house the prop. 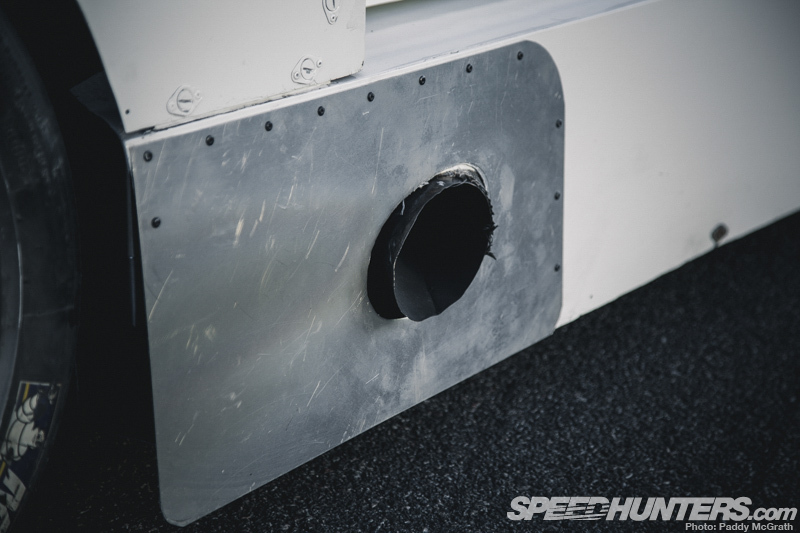 The car features a full flat bottom and as the prop would interfere with that, it’s been housed in its own custom tunnel to keep the flow of air as clean as possible underneath. See? No stone unturned. 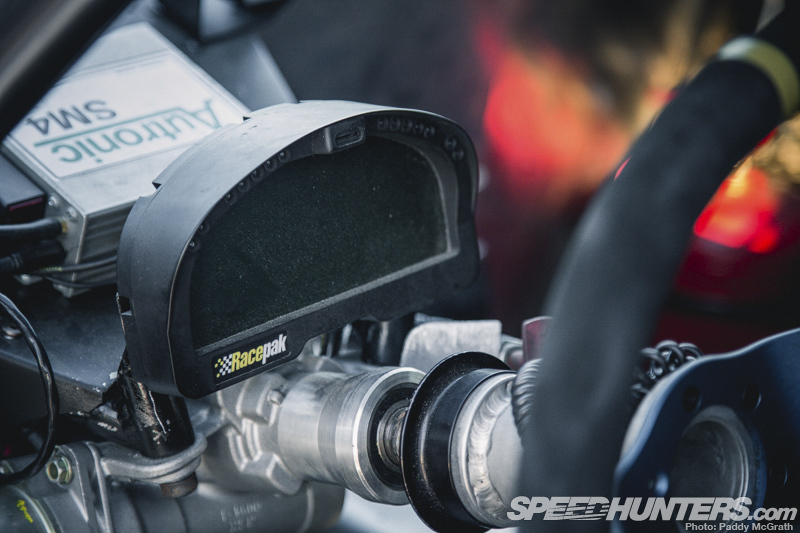 Making sure that Kai’s kept up to date with everything that’s going on out on track is a Racepak IQ3 dash display. 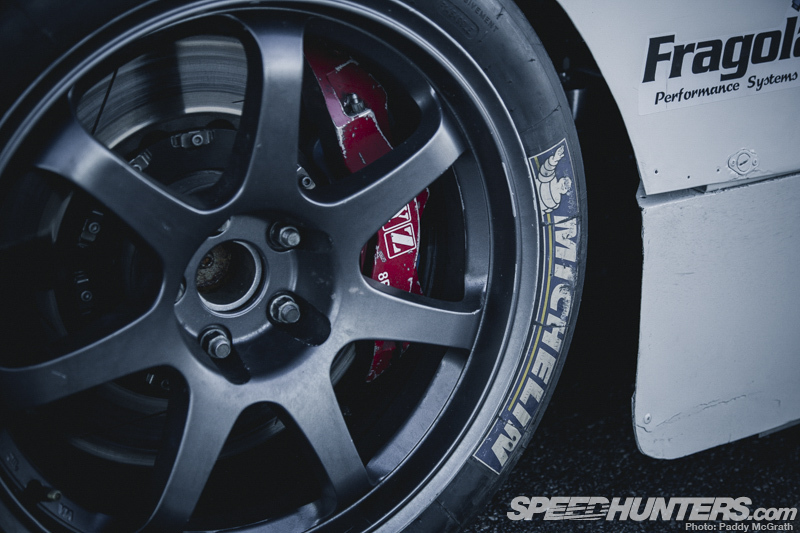 With all that power, you need plenty of grip and lots of stopping power. The 18×10-inch Zito ZL789s are shod with grippy Michelin slicks and the job of hauling the Audi down from speed falls to XYZ calipers and discs – 8-pots up front and 6-pots at the back, plus EBC OrangeStuff pads. This is a build that’s bound to split opinion. The Audi’s savage looks may not be to everyone’s tastes but you can’t deny that it’s got the performance to back them up. And that’s exactly what I love about this car. It makes no apologies for what it is. In fact, it doesn’t need to. Of course, it’s now been joined in the KRB stable by the new/old Lotus Esprit silhouette race car. Does it mean the end for the Audi then? The Esprit is already posting faster lap times at some circuits, but as Kai admits, even the pure-bred Lotus race car can’t yet compete with the Audi in terms of sheer traction out of the corners and outright power. Agile, brutal in its application of power and showing the scars of its battles, the Audi is a true track-hardened warrior. This is a car that doesn’t aim to look good – the form follows function. It doesn’t aim to please others – it exists only to slay its track-based opponents. It’s seen battle numerous times and come out victorious. And as a Sun Tzu quote says, “Victorious warriors win first and then go to war, while defeated warriors go to war first and then seek to win.” This is one warrior that’s definitely winning. 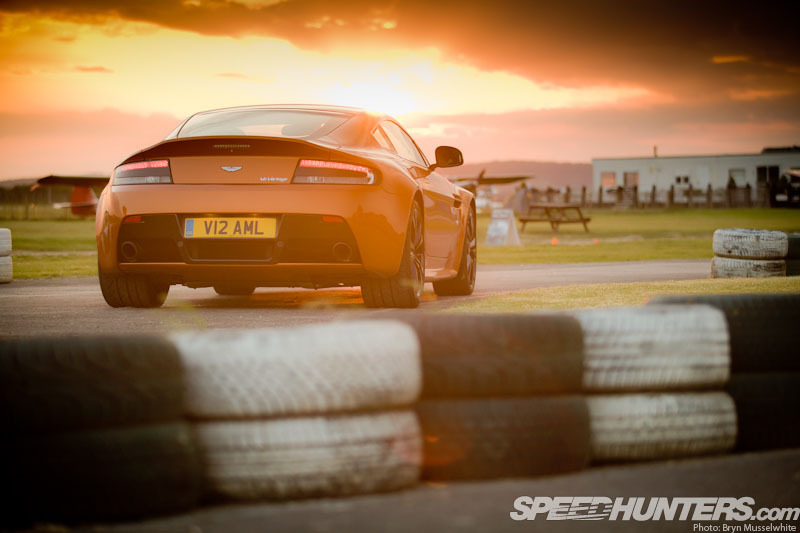 Maximum power: 1061whp. Maximum torque: 1004Nm. Curent race condition between 700-850hp at the wheels. I have made a build and testdrive film of this amazing machine. All from scratch to finished! KaiBakken That makes sense! I was trying to figure out how they moved the engine almost 3 feet with the stock gearbox/AWD setup. I was thinking they would have to flip the engine end to end to the get front axle ahead of the engine!